For the language, see Mixtec language. The Mixtecs (/ˈmiːstɛks, ˈmiːʃtɛks/), or Mixtecos, are indigenous Mesoamerican peoples of Mexico inhabiting the region known as La Mixteca of Oaxaca and Puebla as well as the state of Guerrero's Región Montañas, and Región Costa Chica, which covers parts of the Mexican states of Oaxaca, Guerrero and Puebla. Plate 37 of the Codex Vindobonensis. The central scene supposedly depicts the origin of the Mixtecs as a people whose ancestors sprang from a tree. The stucco reliefs in the Tomb 1 of Zaachila (The Valley, Oaxaca) reveal a remarkable influence from Mixtec art. It is likely that the tomb belongs to a person whose name is registered in the Nuttall Codex. Tomb 1 of Zaachila, Central Valleys of Oaxaca, Late Postclassic. The Mixtec region and the Mixtec peoples are traditionally divided into three groups, two based on their original economic caste and one based on the region they settled. High Mixtecs or mixteco alto were of the upper class and generally richer; the Low Mixtecs or "mixteco bajo" were generally poorer. In recent times, an economic reversal or equalizing has been seen. The third group is Coastal Mixtecs "mixteco de la costa" whose language is closely related to that of the Low Mixtecs; they currently inhabit the Pacific slope of Oaxaca and Guerrero. The Mixtec languages form a major branch of the Oto-Manguean language family. In pre-Columbian times, a number of Mixtecan city states competed with each other and with the Zapotec kingdoms. The major Mixtec polity was Tututepec which rose to prominence in the 11th century under the leadership of Eight Deer Jaguar Claw, the only Mixtec king who ever united the Highland and Lowland polities into a single state. Like the rest of the indigenous peoples of Mexico, the Mixtec were conquered by the Spanish invaders and their indigenous allies in the 16th century. Pre-Columbia Mixtecs numbered around 1.5 million. Today there are approximately 800,000 Mixtec people in Mexico, and there are also large populations in the United States. In pre-Columbian times, the Mixtec were one of the major civilizations of Mesoamerica. Important ancient centres of the Mixtec include the ancient capital of Tilantongo, as well as the sites of Achiutla, Cuilapan, Huajuapan, Mitla, Tlaxiaco, Tututepec, Juxtlahuaca, and Yucuñudahui. The Mixtec also made major constructions at the ancient city of Monte Albán (which had originated as a Zapotec city before the Mixtec gained control of it). The work of Mixtec artisans who produced work in stone, wood, and metal were well regarded throughout ancient Mesoamerica. According to West, "the Mixtec of Oaxaca...were the foremost goldsmiths of Mesoamerica," which included the "lost-wax casting of gold and its alloys." At the height of the Aztec Empire, many Mixtecs paid tribute to the Aztecs, but not all Mixtec towns became vassals. They put up resistance to Spanish rule until they were subdued by the Spanish and their central Mexican allies led by Pedro de Alvarado. There is considerable documentation in the Mixtec (Ñudzahui) native language for the colonial era, which has been studied as part of the New Philology. Mixtec documentation indicates parallels between many indigenous social and political structures with those in the Nahua areas, but published research on the Mixtecs does not primarily focus on economic matters. There is considerable Mixtec documentation for land issues, but sparse for market activity, perhaps because indigenous cabildos did not regulate commerce or mediate economic disputes except for land. Long distance trade existed in the prehispanic era and continued in indigenous hands in the early colonial. In the second half of the colonial period, there were bilingual Mixtec merchants, dealing in both Spanish and indigenous goods, who operated regionally. However, in the Mixteca “by the eighteenth century, commerce was dominated by Spaniards in all but the most local venues of exchange, involving the sale of agricultural commodities and indigenous crafts or the resale of imported goods.”. Despite the development of a local exchange economy, a number of Spaniards with economic interests in Oaxaca, including “[s]ome of the Mixteca priests, merchants, and landowners maintained permanent residence in Puebla, and labor for the obrajes (textile workshops) of the city of Puebla in the sixteenth and seventeenth centuries was sometimes recruited from peasant villages in the Mixteca.” There is evidence of community litigation against Mixtec caciques who leased land to Spaniards and the growth of individually contracted wage labor. Mixtec documentation from the late eighteenth century indicates that “most caciques were simply well-to-do investors in Spanish-style enterprises”; some married non-Indians; and in the late colonial era had little claim to hereditary authority. Map showing the historic Mixtec area. Pre-Classic archeological sites are marked with a triangle, Classic sites with a round dot and Post-classic sites with a square. The Mixtec area, both historically and currently, corresponds roughly to the western half of the state of Oaxaca, with some Mixtec communities extending into the neighboring state of Puebla to the north-west and also the state of Guerrero. The Mixtec people and their homelands are often subdivided into three geographic areas: The Mixteca Alta or Highland Mixtec living in the mountains in, around, and to the west of the Valley of Oaxaca; the Mixteca Baja or Lowland Mixtec living to the north and west of these highlands, and the Mixteca de la Costa or Coastal Mixtec living in the southern plains and the coast of the Pacific Ocean. For most of Mixtec history the Mixteca Alta was the dominant political force, with the capitals of the Mixtec nation located in the central highlands. The valley of Oaxaca itself was often a disputed border region, sometimes dominated by the Mixtec and sometimes by their neighbors to the east, the Zapotec. An ancient Coixtlahuaca Basin cave site known as the Colossal Natural Bridge is an important sacred place for the Mixtec. 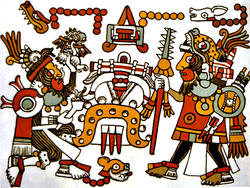 The preconquest Codex Bodley, page 21, names Lord Eight Grass as being the last king of Tiaxiaco. The Mixtecan languages (in their many variants) were estimated to be spoken by about 300,000 people at the end of the 20th century, although the majority of Mixtec speakers also had at least a working knowledge of the Spanish language. Some Mixtecan languages are called by names other than Mixtec, particularly Cuicatec (Cuicateco), and Triqui (or Trique). The Mixtec are well known in the anthropological world for their Codices, or phonetic pictures in which they wrote their history and genealogies in deerskin in the "fold-book" form. The best known story of the Mixtec Codices is that of Lord Eight Deer, named after the day in which he was born, whose personal name is Jaguar Claw, and whose epic history is related in several codices, including the Codex Bodley and Codex Zouche-Nuttall. He successfully conquered and united most of the Mixteca region. They were also known for their exceptional mastery of jewelry and mosaic, in which gold and turquoise figure prominently. Products by Mixtec goldsmiths formed an important part of the tribute the Mixtecs paid to the Aztecs during parts of their history. [unreliable source?] Turquoise mosaic masks also played an important role in both political and religious functions. These masks were used as gifts to form political alliances, in ceremonies during which the wearer of the mask impersonated a god, and were fixed to funerary bundles that were seen as oracles. ^ Comisión Nacional para el Desarrollo de los Pueblos Indios (CDI) (2000): Lenguas indígenas de México. Viewed 2006-11-30. ^ Claudia Torrens (2011-05-28). "Some NY immigrants cite lack of Spanish as barrier". UTSanDiego.com. Retrieved 2013-02-10. ^ Kevin Terraciano, ‘’The Mixtecs of Colonial Oaxaca: Ñudzahui History, Sixteen through Eighteenth Centuries’’. Stanford: Stanford University Press 2001, 248-49. ^ William B. Taylor, “Town and Country in the Valley of Oaxaca”, ‘’The Provinces of Early Mexico’’, Ida Altman and James Lockhart, eds. Los Angeles, UCLA Latin American Center 1976, p. 74. ^ "Ancient Scripts: Mixtec". www.ancientscripts.com. ^ McEwan, Colin; et al. (2006). Turquoise Mosaics from Mexico. Durham: Duke University Press. ^ Headrick, Annabeth (1999). "The Street of the Dead ... It Really Was: Mortuary bundles at Teotihuacan". Ancient Mesoamerica. 10 (1): 69–85. doi:10.1017/S0956536199101044. JSTOR 26307065. Kevin Terraciano (2004). The Mixtecs of Colonial Oaxaca: Nudzahui History, Sixteenth Through Eighteenth Centuries. Stanford University Press. ISBN 978-0804751049.